On the Accountability Chart there is a box for each of these three functions. Above the three major functions there is an Integrator. He or she is the person who seamlessly makes the three core functions work together, removing obstacles and solving problems so that the whole company can function and thrive. The Integrator is responsible for the bottom line, profit and loss and making sure the company is moving forward and eliminating any problems. About half the time, there is also a second role, the Visionary, positioned in a box above the Integrator. The Visionary is the spirited entrepreneur who comes up with all the great ideas, is in charge of the big relationships and is the spokesperson for the business. They are responsible for the culture, the passion, the vision. Sometimes the Visionary is not a strong “completer finisher” and they are typically not good at executing and implementing over a long period of time. If you have a strong Visionary, as your business grows, you will need to put in place an Integrator to seamlessly integrate all the working parts and execute on the company’s vision. These five core roles make up your leadership team. Each of the five roles has five things they must be responsible for delivering. This allows each role to understand exactly where they fit in the organisation, their key responsibilities, and what they must get done in order to be successful. Even if you are a solo entrepreneur, you still need an accountability chart. In the beginning you wear all the hats and execute on all the roles. As you grow, it gives you a clear picture of who you need, when, in the organisation. These roles do not have to be a full time employee. They can be outsourced to specialists, so your business receives quality and expertise without the full-time positions. The beauty of the EOS Accountability Chart is that as your business grows, it simply grows with it. Having the right structure in place, will enable you to find the right people and place them in the right seats. If you would like to find out what your accountability chart should look like and learn about the other EOS tools, contact us to arrange a complementary 90 minute introduction. 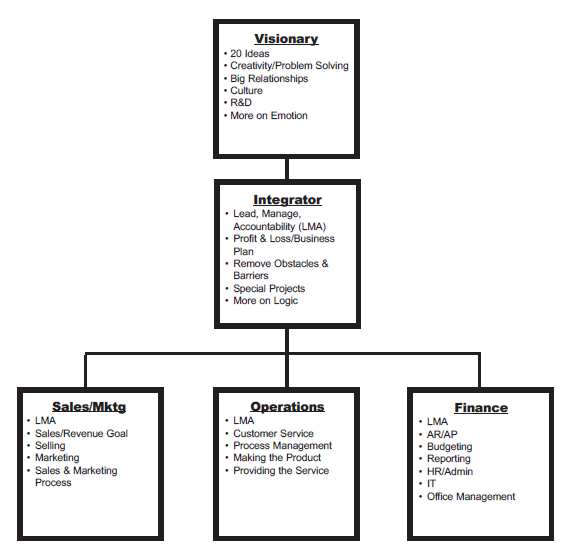 I love that simple organisational chart. I can see clearly where my strengths would fit into a organisation…. And those of my clients. So glad you like it. If you’d like to find out more about it, do get in touch by email on hello@boldclaritycom.